Home » Entertainment » Deepika Padukone and Ranveer Singh have finally announced their wedding date. Deepika Padukone and Ranveer Singh have finally announced their wedding date. 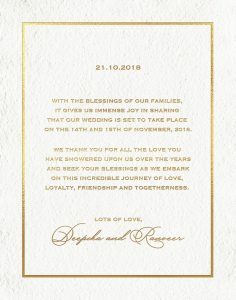 New Delhi: 21/10/18:After months of speculation, popular Bollywood actors Deepika Padukone and Ranveer Singh have finally announced their wedding date. 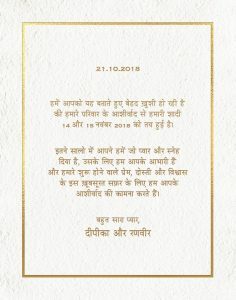 The big fat wedding is scheduled to be held on November 14 and 15.